(No, sadly, this is not a tribute post to top Estonian combo Claire's Birthday a.k.a. Ruffus who gave us one of the best Eurovision entries of the 21st century). However, if you are a fan of classic pop from the 1980s, then you might be interested in Classic Pop magazine. This is a new(ish) magazine which is now on its 5th issue, however I've only recently discovered it and bought the current issue and another recent one. Back in the 1980s, I wasn't really listening to mainstream pop, as I had turned my attention elsewhere (check out my older post http://europecrazy.blogspot.co.uk/2011/03/retro-saturday-special-1981-and-my.html which goes into that in more detail). However as that post also illustrates, I was living a musical double-life and was obsessed by the likes of Adam Ant and debut-album Duran Duran. However, whether you love or hate the 1980s you can't deny that many of the songs and artists have turned out to have a very long shelf-life indeed. Classic Pop is aimed fairly and squarely at the original Smash Hits generation who have grown up, grown older, and who will immediately recognise the opening bars of any 80s top 40 hit. 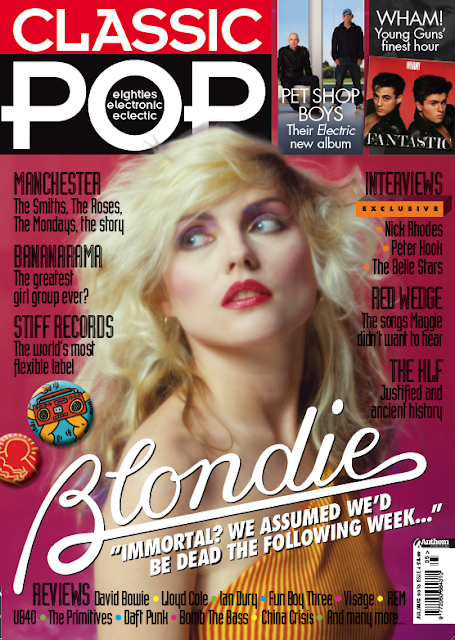 It's not just a retro tribute though, as where the magazine succeeds is in mixing then and now, featuring artists from the 80s (and 90s) who are still recording and/or playing live; or featuring modern-day artists who may owe a musical debt to 30-odd years ago. More obscure pop names also get a look-in as well, (although maybe not as obscure as the acts featured on the many wonderful 80s pop blogs out there!) and you realise just how much good and enduring music was around three decades ago. One negative point though is the un-80s cover price of £5.99; although all magazines these days are overpriced though, so it's not the only one. Maybe they're hoping to drive everyone to a subscription or opt for the lower-priced tablet edition? It's a good read though and an escape from the torture of the 2013 top 40, which is all over-hyped international stars, UK 'grime'/'dubstep'/'the new boring' and bog-standard 'EDM'. I doubt whether 30 years down the line, when I'm hurtling towards my 80th birthday and zimmer-framing it into the 2043 equivalent of WH Smith, that my eyes will light up with glee when I spot a nostalgia magazine with the likes of Rita Ora, Emeli Sande, Rihanna, Rudimental, Wiley, Jessie J and Ed Sheeran on the cover. I will definitely pass on that one!